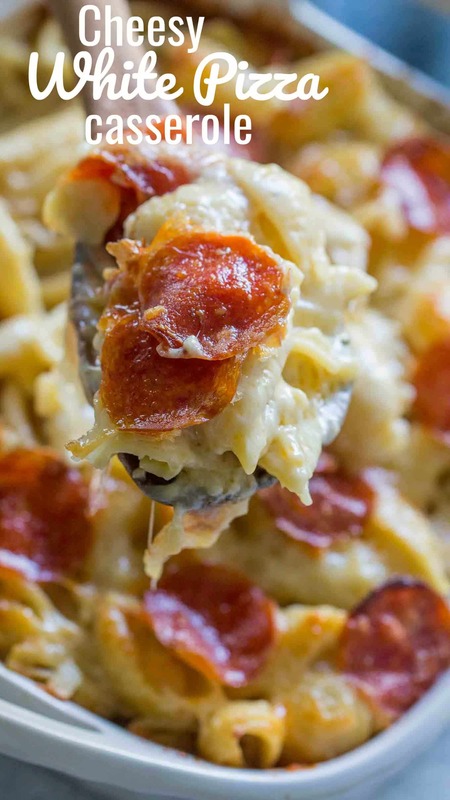 White Pizza Casserole is a delicious blend of cheesy white pizza sauce, pasta and lots of pepperoni, baked to crispy perfection in a casserole dish. Casserole recipes are a staple around here, they are easy to make and usually make enough leftovers that you don’t have to worry about cooking dinner the next day. My other favorites are Cheesy Crack Chicken Casserole, Chicken Hash-brown Casserole. and Chicken Spaghetti Casserole. 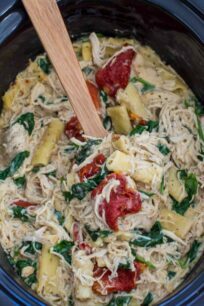 White Pizza Casserole is such a delicious dinner that is easy to make and feeds a large family. I can never say no to cheese and pasta and if it would be my way, I would probably survive on pizza and ice cream. Well, I do love greens and healthy meals, but pizza and pasta are my weaknesses. Now, wouldn’t it be great if the two were combined, by making a White Pizza Casserole from pasta? That is one delicious decision that you will not regret. 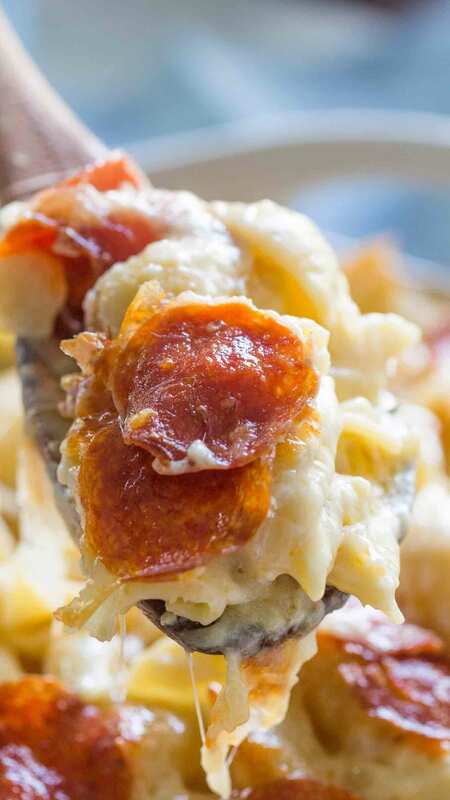 This easy meal is always a hit, its cheesy, with a crispy pepperoni top, and all the flavors of a tasty pizza in casserole form. 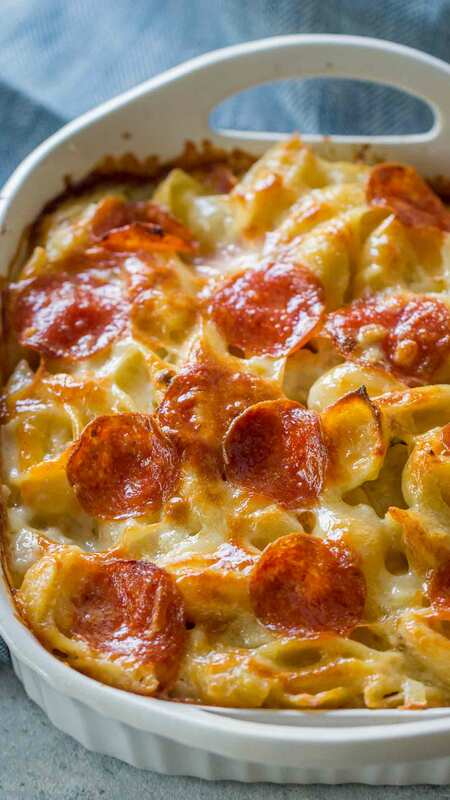 Kids will also fall in love with this casserole. 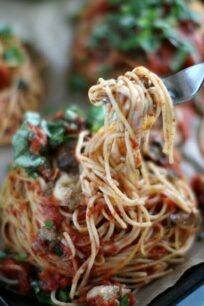 This recipe is so easy and adaptable that you can add your favorite mix-ins just like you would choose them to top a pizza. The combinations are endless, you just have to use your imagination and use the ones you like more. I am a huge fan of adding just pepperoni. We also like this casserole with spicy jalapeños, sausage and chicken. You can make it vegetarian by mixing in mushrooms, tomatoes and a handful of fresh spinach. Or transform into a Margherita casserole by adding 1/3 cup pesto and cherry tomatoes, top it with fresh buffalo mozzarella for the ultimate cheesy top! Use quality pepperoni, it will make a huge difference in this dish. If you prefer the casserole spicy add jalapenos, or add some hot sauce into mixture. Mozzarella cheese can also be substituted with provolone cheese or sharp cheddar. For a spicy twist, use Pepper Jack. You can add slice mushrooms or black pitted olives to this dish. Absolutely! You can substitute pepperoni with chicken, turkey or bacon. The cooking time might vary as well based on each meat type. How to freeze and thaw this Cheesy White Pizza Casserole? To freeze, cover pan tightly with plastic wrap and foil. Freeze for up to 3 months. When ready to cook, thaw in refrigerator overnight. Remove cover and bake at 350 degrees for about 30-45 min. 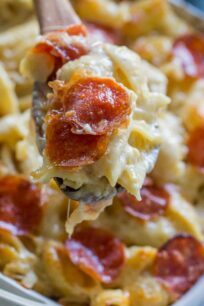 White Pizza Casserole is a delicious blend of cheesy white pizza sauce, pasta and lots of pepperoni baked to crispy perfection in a casserole dish. Add the flour and stir to distribute flour. Increase heat up to medium and cook for a minute or two stirring continuously. Slowly stir in warmed cream in a slow drizzle and stir constantly to avoid lumps. Bring cream mixture to a very slight simmer and cook until it thickens slightly. When the sauce is the consistency of a gravy, season it with fresh thyme, oregano and a pinch of salt and pepper. 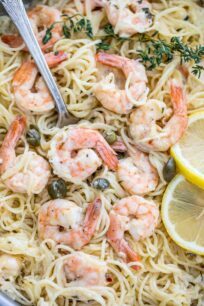 Remove it from heat and stir in parmesan cheese. Cook penne pasta according to package instructions. Drain and set aside. Add cooked pasta, 3/4 of the pepperoni's, 1 cup of shredded mozzarella cheese and the white pizza sauce to a large bowl and gently toss to combine. Pour mixture into a greased 9x13'' pan. Sprinkle 1 1/s cups of mozzarella cheese on top (you can use more or less cheese), top with remaining pepperoni pieces. Bake for 25-30 minutes or until cheese is golden and bubbling. For a golden brown top, broil for the last minutes of baking. I’d do extra time on the treadmill so I could have a bowl of this! I love that the family can customize this however they like! Everyone’s happy! This looks fantastic! I know this will quickly become a family favorite! This would be fun to add in half of what the kids like and half of what the parents like! Loving the cheesy goodness! I am thinking of all the ways I can change this up as I am reading your mix in ideas! They all sound amazing! Oh wow, that is so cheesy and perfect! My kids will love it! This casserole looks so delicious! That’s the perfect comfort food right there! Absolutely delish. I bumped up the veggies by adding sautéed mushrooms, fresh baby spinach, and sundried tomatoes. I did not have fresh herbs so I used Italian seasoning. 4 cups uncooked pasta or 4 cups cooked pasta?